Taking a cue from the tough message delivered by Congress president Sonia Gandhi yesterday, party leaders set out to systematically demolish the BJP’s arguments on the coal issue. Refusing to budge from its position that Prime Minister Manmohan Singh must resign in the wake of the CAG report over the allocation of coal blocks, the BJP today announced that it would take its protest over the issue against the UPA regime to the streets. Continued dependence on fertilisers’ imports to cater to agricultural needs of India has prompted a “dismayed” Parliamentary Panel to urge the government to finalise the new investment policy to attract fresh investments in the fertiliser industry. 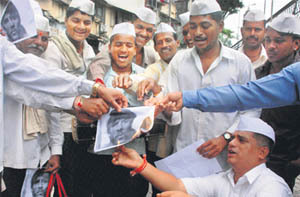 Maharashtra's ruling party leaders, police officials and the kin of martyrs who lost their lives in the 26/11 terrorist attack nearly four years ago are demanding that the execution of Ajmal Kasab, the lone Pakistani terrorist to be caught alive in the incident, be carried out as early as possible. Availability and issuance of medicines under the Ex-servicemen’s Contributory Health Scheme (ECHS) is expected to be streamlined soon. Tendering process for outsourcing pharmacy operations will take off shortly. The majestic Falaknuma Palace, once home to a Nizam ruler and now a seven-star heritage hotel managed by the Taj Group, has been valued at £10million by the British art business and fine art auction house Christie’s. The valuation by Christie’s was a conservative appraisal of the premises in terms of paintings, furniture, cutlery, manuscripts, ivory, pottery and glass, said hotel general manager Girish Sehgal. Spread over 35 acres and built in 1893, the Falaknuma Palace is a majestic blend of Italian and Tudor architecture. Even as the Telangana issue continues to hang fire with no solution in sight, another movement is taking shape in Andhra to fight for a separate state for Rayalaseema region. Trying to downplay former Gujarat minister Mayaben Kodnani's conviction in a Gujarat riots case, the BJP today rejected the demand for state Chief Minister Narendra Modi over the matter. Reprimanding the Central Bureau of Investigation (CBI) for the inordinate delay in completing the National Rural Health Mission (NRHM) probe, the Lucknow Bench of the Allahabad High Court today threatened to hand over the investigation to some other agency if the CBI was not in a position to complete it. The CBI today registered a case against arms dealer Abhishek Verma under the Official Secret Act (OSA) on the basis of a complaint filed by the Defence Ministry requesting the agency to probe “leakage of secret defence documents”. Five persons were today killed and two others injured in an accident on the newly-built Yamuna Expressway near here. The toll in continuing violence in Assam mounted to 95 today with the recovery of seven bodies even as a new district was brought under indefinite curfew and the government called for a ban on bandhs for a month. In the report '26/11, Samjhauta train blasts very different: PM' that appeared on page 2 on Wednesday (August 29), the headline inadvertently attributes the remarks to the PM, which is not the case. The error is regretted. They pointed to the ad hoc manner in which the NDA regime allocated coal blocks to benefit favoured companies and cited past examples of the principal Opposition party’s tirade against Constitutional authorities, especially the CAG. Since the BJP is not allowing Parliament to function to press its demand for Prime Minister Manmohan Singh’s resignation, the Congress and the main Opposition party are arguing their case on the coal blocks allocation in public fora. And if the strident positions taken by the two sides are anything to go by, the battle between them will further intensify in the days ahead as the Congress and the BJP have set their sights on the year-end Assembly polls in Gujarat and Himachal Pradesh. Today, the Congress fielded Human Resource Development (HRD) Minister Kapil Sibal to defend the government and punch holes in the BJP’s statements on the coal issue. Accusing senior BJP leader Arun Jaitley of “selective amnesia”, Sibal gave specific instances of how he and his colleagues had attacked CAG following its reports on disinvestment of Centaur Hotel and coffin purchases. The minister also gave examples of the opaque manner in which coal blocks were allocated by the NDA government, stressing that there were no formal procedures in place at that time while the UPA had streamlined the procedures. On the contrary, Sibal charged, it is the BJP which is undermining Parliamentary democracy by stalling a debate on the issue. The Congress has been in attack mode ever since the CAG report on coal blocks allocation was tabled in Parliament. To keep up the pressure on the BJP, Sibal distributed several documents giving details of the companies which benefited from the NDA’s policies. Addressing a press conference here, BJP spokesman Prakash Javadekar said the party would organise protest rallies in nearly 40 major cities on August 31, September 1 and 2 to ‘expose’ the UPA regime over the allocations of coal blocks. The rallies will be addressed by top party leaders, including LK Advani, Sushma Swaraj, Arun Jaitley, Murali Manohar Joshi, Rajnath Singh, Yashwant Sinha, M Venkaiah Naidu and others. “This is the beginning of our fight against corruption. We appeal to the people to join us in this fight,” he added. During the initial stage of the protest, party leaders would also hold news conferences in various cities and towns. The stir is likely to be intensified after the monsoon session of Parliament concludes on September 7. It is still not clear if Parliament could be adjourned sine die earlier in view of the ongoing stand-off between the government and the BJP. The main Opposition party, however, appears in no mood to allow Parliament to function when it meets tomorrow after the Onam holiday today. Alleging that the screening committee formed by the government for coal block allocations was a facade, Javadaker said the Centre was now trying to put the entire blame on the states. Welcoming the Supreme Court's verdict, Maharashtra's Home Minister RR Patil told reporters that the death sentence be carried out as early as possible. "This case has been watched with interest by everyone. Innocent people were killed in a terror conspiracy hatched in Pakistan. It was an attack on the country. The hand of terrorist outfits like Lashkar-e-Toiba became evident after our martyrs caught Kasab alive and thus helped bring him to justice. We will ask the Centre to ensure that the death sentence is carried out as early as possible," Patil told reporters here. The minister, however, added that the government was disappointed by the acquittal of two Indians — Faheem Ansari and Sabauddin Ahmed — who were arrested in connection with the attack. “We will seek legal advice on this,” Patil added. The minister said that senior police officials like Rakesh Maria and the officers of the Crime Branch and the Anti-Terror Squad played a major role in establishing Kasab's guilt. Welcoming the apex court judgment, Joint Commissioner of Police (Crime) Himanshu Roy, who heads the Crime Branch, said the verdict "was an important milestone in the fight against terrorism." Kasab's plea before the apex court on the grounds that he did not get a fair trial was watched keenly by the kin of police officials who lost their lives in the attack. "It is only fair that the Supreme Court has supported the verdict against Kasab. He killed so many innocent persons and he should not go unpunished," Kalpana Pawar, wife of police constable Ambadas Pawar who lost his life in the incident, said. PTI adds: External Affairs Minister SM Krishna hoped that Pakistan would not fail to take note of the Supreme Court’s verdict of upholding the death sentence of Ajmal Kasab. "The Supreme Court is the highest court of appeal in India. When it announces something, it becomes the law of the land," said Krishna. Law Minister Salman Khurshid said the verdict was inevitable and the court had reached the obvious conclusion. He said the case had gone through the due process of law. "Nobody can raise a finger at the Indian legal system. Kasab was given a chance to defend. Many would not have liked this kind of timeline, but at the end of the day, it will give self-assurance that justice is finally being done," Khurshid told a news channel. 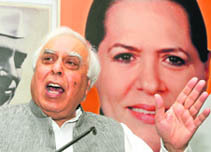 Congress general secretary Digvijay Singh said punishment to Kasab should be executed quickly. Party spokesperson Rashid Alvi said the world knew the role of Pakistan in 26/11 terror attack and hoped that the judgment would be implemented soon. "In this country, court does its work. Everyone knows what Kasab has done. Law has taken its own course. The Supreme Court has given the judgment and I hope it will be implemented soon," Alvi said. Continued dependence on fertilisers’ imports to cater to agricultural needs of India has prompted a “dismayed” Parliamentary Panel to urge the government to finalise the new investment policy to attract fresh investments in the fertiliser industry. Public-private partnership can also play a crucial role in reviving, expanding and setting up of new fertilisers units, the standing committee on chemicals and fertilisers examining production, demand, availability and distribution of fertilisers in the country said today. The committee expressed disappointment that revival of fertiliser plants in the public sector could not take off due to unavailability of natural gas - a major feedstock for production. In its report tabled in the Parliament, the committee headed by BJP’s Gopinath Munde also expressed shock over rampant instances of black-marketing and artificial scarcity of fertilisers created by hoarders despite a well-planned system of assessing requirement and availability operated by the department. During 2011-12, the production was 222 lakh tonnes and imports around 90 lakh tonnes, it said. According to the figures released separately in response to a question in Parliament, the Ministry said India imported urea worth $1,212.65 million in 2009-10, $1,832.50 million in 2010-11 and $3,222.28 million in 2011-12. The year-wise quantity of P&K fertilisers imported during the past three years also increased on a yearly basis. It asked the government to revamp and revive fertiliser units through managerial and technical support, feedstock and adequate infrastructure, especially availability of natural gas. To facilitate new investments in the urea sector, an investment policy was notified in September 2008 by the fertilisers department based on recommendations of Planning Commission member Abhijit Sen. The availability of natural gas as expected by the Sen Committee did not fructify and the estimated cost of new projects also increased. The CCEA is now considering a report on investment policy by member Planning commission Saumitra Chaudhary. Under the scheme, a private vendor would handle procurement and distribution of medicines as prescribed to ECHS subscribers at pre-fixed discounted prices and the bill for the same would be picked up by the government. The move to outsource pharmacy operations comes in the wake of procedural delays and shortages of medicines procured through military hospitals. As reported earlier, non-availability of prescribed medicines at many ECHS polyclinics is a sore point with many veterans who depend on them for medicare. Under the first phase, 100 polyclinics under six regional centres - those in Chandigarh, Delhi, Lucknow, Pune, Hyderabad and Thiruvananthapuram - would be brought under the ambit of outsourcing. The lowest bid would be decided by the highest discount quoted by the vendor, who will procure medicines through his own sources. Under the present system, the Director General Armed Forces Medical Services (DGAFMS) is responsible for procuring and ensuring availability of medicines, for which funds are placed with them by the ECHS. The DGAFMS sub-allocates the funds to various medical supply depots for central procurement and to military hospitals for local purchase of medicines. These medicines are then transferred to the ECHS polyclinics. It typically took six-eight weeks to purchase medicines and even emergency procurement by hospitals was affected. Further, no additional staff had been authorised to the DGAFMS to cater to the ever-increasing additional load of the ECHS. The government-sponsored ECHS has 260 functional polyclinics besides about 1,400 empanelled private hospitals that provide medicare to about 40 lakh retired armed forces personnel and their dependents. It has an operating budget of over Rs 1,000 crore. The majestic Falaknuma Palace, once home to a Nizam ruler and now a seven-star heritage hotel managed by the Taj Group, has been valued at £10million by the British art business and fine art auction house Christie’s. The valuation by Christie’s was a conservative appraisal of the premises in terms of paintings, furniture, cutlery, manuscripts, ivory, pottery and glass, said hotel general manager Girish Sehgal. Spread over 35 acres and built in 1893, the Falaknuma Palace is a majestic blend of Italian and Tudor architecture. The scorpion-shaped, all-marble structure is located on banks of the Musi River, about 5 km from the historic Charminar. It was the royal residence of Nizam Mehboob Ali Khan. With some of the items costing upwards of £450,000, an estimate of the palace is around £10 million, the hotel official said. 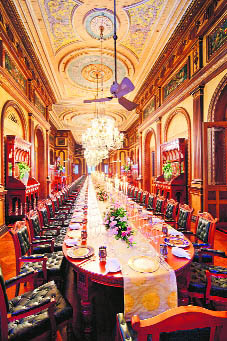 The interiors include murals, 16 types of wood like mahogany, teak and Indonesian wood, 18 types of marble, gold-rimmed lamps and wall fixtures like picture frames, furniture, Oriental hand-crafted closets, paintings of the English royal family and the Nawabs, cutlery, manuscripts, first edition books and stained-glass paintings. The interiors are a splendid interplay of Venetian chandeliers and intricate frescoes. The palace also has a 101-seat dining hall and the Durbar Hall embellished with intricately carved wooden ceilings, parquet flooring, regal walnut wood furniture and handcrafted mirrors. 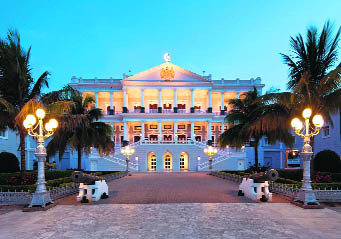 The Falaknuma Palace has several unique things to its credit. It had the country's first GE refrigerator, first electrical switch board, first telephone exchange and first petrol pump. Princess Esra Birgin, the first wife of Mukarram Jah, the scion of the Nizam family, played a key role in the restoration of the palace. The architectural marvel was used by the Nizam to entertain his equally royal guests such as King Edward VIII and last Russian Tsar, Nicholas II. An ultimate symbol of royalty and opulence, the palace was bought by Taj Group of Hotels in 2000 and restored to its past glory after 10 years of painstaking restoration works. "Any attempt to justify the conduct of the TV channels by citing the right to freedom of speech and expression would be totally wrong and unacceptable in such a situation. The freedom of speech and expression, like all other freedoms under Article 19, is subject to reasonable restrictions. "An action tending to violate another person’s right to life guaranteed under Article 21 or putting the national security in jeopardy can never be justified by taking the plea of freedom of speech and expression," said a Bench of justices Aftab Alam and CK Prasad in its verdict that upheld the death sentence awarded to terrorist Ajmal Kasab. "It is beyond doubt that the way their (security forces') operations were freely shown made the task of the security forces not only exceedingly difficult but also dangerous and risky," it added. The Bench also questioned the media's argument that the regulatory mechanism for it must come only from within. A new outfit — ‘Rayalaseema Parirakshana Samithi’ (RPS) — comprising representatives from social organisations and political groups, has been launched with an aim to achieve statehood for the backward Rayalaseema region comprising four districts of Kurnool, Kadapa, Chittoor and Anantapur. It gave call to the people of the region to join the fight for trifurcation of Andhra Pradesh into Telangana, Rayalaseema and coastal Andhra at a Rayalaseema people's conclave organised here recently. The day-long meeting attended by "settlers" from Rayalaseema in the capital city vowed to achieve Rayalaseema state and formed a Rayalaseema joint action committee (RJAC) on the lines of the Telangana JAC to spearhead the movement. RPS president B Rajasekhara Reddy, who is also a general secretary of the Opposition Telugu Desam Party, declared that they would take up an 800-km padayatra in the last week of September from a remote village in Kurnool district in support of the cause. ''We don't want to politicise the judicial process. This is the first court, it is a judicial process, it will go on," BJP spokesperson Prakash Javadekar told the media here. Asked if the state government was also not in the dock in the wake of the court ruling. he shot back, ''I don't think so,” and said there was no question of Modi taking even note of the Congress party's demand for his resignation. As far as Kodnani was concerned, Javadekar said she had resigned from her post as soon as a chargesheet was filed against her in the case relating to the killing of 97 Muslims by a mob in Ahmedabad’s Naroda Patiya neighbourhood in 2002. A special court in Gujarat today convicted 32 persons, including Kodnani and Bajrang Dal leader Babu Bajrangi, for the massacre in Naroda Patiya. "Whether it is the anti-Sikh riots of 1984, or the Maharashtra, Assam or Gujarat riots, it is unfortunate and a blot on the face of the nation. Any level of condemnation for any riot is insufficient. 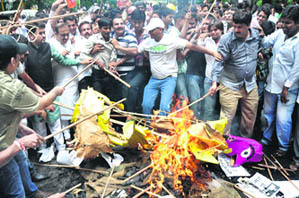 We have always criticised the Godhara incident and Gujarat riots, that is our stand," Javadekar said. This is the second time in a week when the CBI has been pulled up by the Allahabad High Court for the slow progress in the court-ordered probe into the NRHM scam and the murders of two Chief Medical Officers (CMO) and mysterious death of a Deputy CMO. "The state police is better than you. The probe could be handed over to them if you are unable to do it,” said the Division Bench comprising Justices Imtiaz Murtaza and Ashwani Kumar Singh when the CBI pleaded for more time to complete its investigation. On the next date - September 12 - the court has directed the CBI SP monitoring the NRHM cases to appear before them in person along with all records and a written affidavit regarding the case. The CBI was expected to submit a status report of the complete probe today. Unlike last time, the court today praised the state government for promptly responding to its order of August 23 by sanctioning the prosecution of 34 government employees, including 22 doctors and officers, in connection with the NRHM scam. The Defence Ministry has already provided the CBI with a list of seven documents that come under the definition of the Official Secrets Act (OSA). The documents which are believed to be of secret nature include acquisition plans for next five years for the Indian Air Force, sources said. The Defence Ministry submitted the complaint on August 24 to probe leakage of secret official defence documents. The CBI discussed this issue at senior level to register the case as there was no mention of Abhishek in the complaint, sources said. Sources said the documents had not been recovered from Verma’s possession. They were disclosed by other persons. The sources added that retired Defence Ministry officials could be questioned in the case. The mishap occurred when a Delhi-bound carrier, laden with bags of vegetables and carrying traders, rammed against the fencing of the expressway. Subsequently, as it hit the culvert, made as an underpass facility for villagers, five persons atop the vehicle, fell down. All five died on the spot, SP (Rural) Raju Babu Singh said adding two persons, who were in the cabin of the carrier, were also seriously injured. They have been admitted to Swarn Jayanti Hospital here. Two bodies were recovered from Dhemaji and five others from Dhubri, Chirang, Baksa and Kokrajhar districts late last night and this morning, official sources said, adding most of the bodies were those of relief camp refugees. "The toll now stands at 95," Assam IGP (Law and Order) LR Bishnoi said.